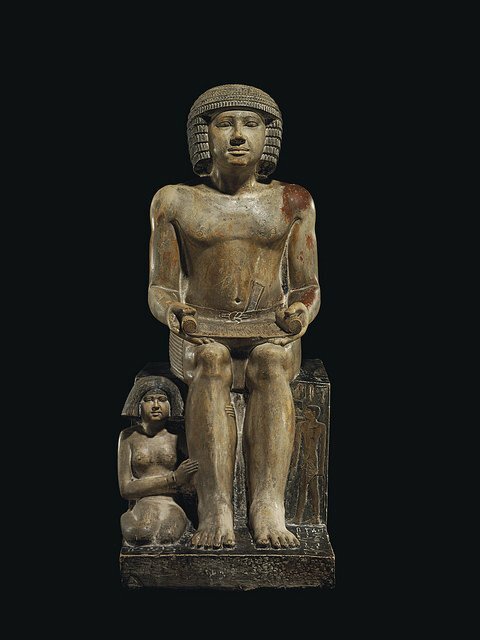 Sekhemka: now you see him , soon you won’t [probably]. Sources in the Art World have told thePipeLine that the anonymous buyer who paid a hammer price of £15.76 million for the internationally important statue of the Egyptian Scribe Sekhemka is a private collector based in the USA and not a Qatari as was claimed previously by sources in Cairo. Separately thePipeLine also understands from sources close to the process that the Egyptian Government has been in regular contact with the UK Department for Culture Media and Sport [DCMS] in an attempt to ensure the statue remains on public display, possibly through an exchange between an appropriate UK museum and Cairo. However, the DCMS is believed to be resisting appeals to intervene directly. If proven the latest revelation as to the nature and nationality of the buyer will enrage campaigners and cause even more embarrassing for Northampton Borough Council, which, in a move which the Arts Council and Museums Association claimed was utterly unethical, reached an agreement to sell the statue in 2014 with another private collector, Lord Northampton. The purchase of the statue by a private collector who would remove Sekhemka from public display in Northampton Museum and place it beyond the reach of researchers was the greatest fear of campaigners from the Save Sekhemka Action Group [SSAG] in Northampton and Cairo, which fought to prevent the sale of the statue and then to ensure it remains available for the public to enjoy and scholars to research. Lord Northampton, the ancestor of whom brought the statue to the UK from Egypt in the mid 19th century, and who may have been the actual owner of the statue under a 19th century Deed of Gift, profited to the tune of over £6 million from the sale of Sekhemka at Christie’s, even though then Northampton Borough Council Leader, David Mackintosh [now the MP for Northampton South], claimed that the Council owned the statue and a Council officer signed the sales agreement to that effect. The Council also paid all the seller fees and taxes associated with the sale. This has led to allegations that the agreement was also designed to be legally “tax efficient” for Lord Northampton, for example limiting his exposure to Capital Gains Tax. Following the sale the Department for Culture Media and Sport placed a temporary export ban on the statue on account of its quality and importance to the nation. However, the current ban is understood to have expired on 29 March and the Secretary of State John Whittingdale and Culture Minister Ed Vaizey are reported to have made no attempt to broker a deal with the buyer to retain the statue in the public domain in spite of appeals from campaigners that they intervene. Therefore the purchaser could apply for an export licence at any time. However, thePipeline understands that, while there is currently no evidence that anyone connected with the sale acted illegally, legal experts in the UK and Cairo are still looking at the documentation relating to the export of antiquities from Egypt at the time Sekhemka was apparently sent to the UK and at the details of the sale by Northampton Council with a view to challenging the validity of the sale. However, they are frustrated by the refusal of Northampton Council to release details of the negotiations with Lord Northampton, even though those negotiations related to the disposal of what the Council itself claimed was a multi million pound public asset, through which the Council rewarded a private individual with £6 million of public money.